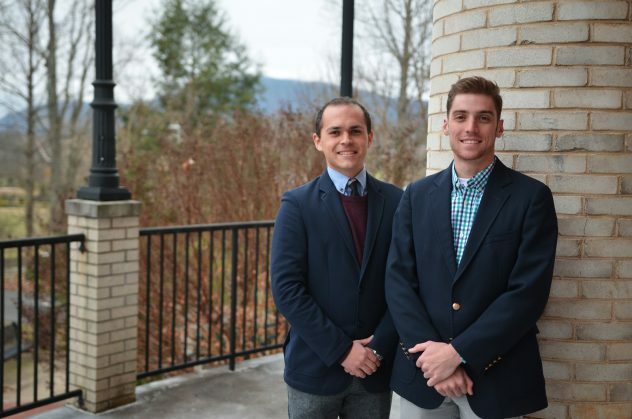 Seniors Jonathan Russell and Samuel Wentworth competed in the semifinals of the AMC3 challenge. MILLIGAN COLLEGE, Tenn. (Dec. 5, 2018) — Several Milligan students recently experienced the political and judicial system firsthand as they argued legal cases in the Old Supreme Court Chamber and deliberated legislation in the Senate and House of Representative Chambers at the Tennessee State Capitol. This year marked the third consecutive year that Milligan students have participated in the Appellate Moot Court Collegiate Challenge (AMC3) and the Tennessee Intercollegiate State Legislature (TISL). These events allow college students across the state to participate and learn more about the state’s government and laws. Milligan seniors, Jonathan Russell, of Kingsport, Tennessee, and Samuel Wentworth, of Sugar Creek, Ohio, became the first Milligan group to advance to the semifinals of the AMC3, the only statewide moot court competition for undergraduate students. While 27 teams entered the competition, only eight teams advanced to the semifinal. Russell and Wentworth were successful in the semifinal, scoring a few points lower in one round to the eventual AMC3 champions, a team from Vanderbilt University. Each team competing in AMC3 was presented with the same legal case several months in advance. They submitted a 12- to 14-page brief on the case and prepared arguments for both sides of the case to present during the competition. Wentworth and Russell acknowledged that the competition required a lot of work and preparation. Hard work paid off for these two seniors. In their final round, Russell and Wentworth decided to take a chance and revised their arguments for the court. The new approach proved successful, as the competition was unprepared to counter their argument. 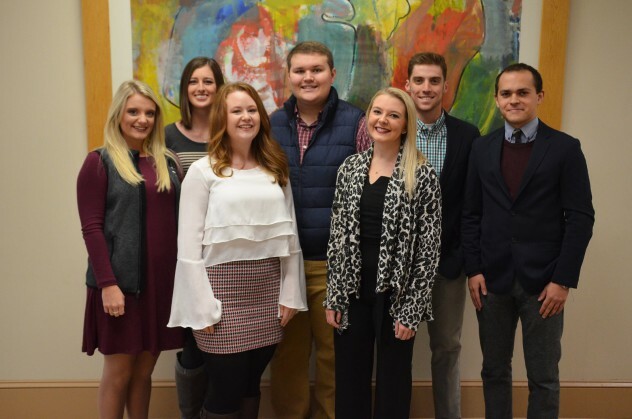 Seven Milligan students traveled to Nashville, Tennessee, for TISL and AMC3. From left to right: Tessa Stevenson, Brianna Snyder, Julie Deacons, Dalton Shell, Reagan Jeffers, Samuel Wentworth and Jonathan Russell. Another Milligan team, comprised of Julie Deakins, a senior from Johnson City, Tennessee, and Reagan Jeffers, a senior from Rogersville, Tennessee, competed in the AMC3 competition. For Deakins, the weekend was a challenging but rewarding experience. While in Nashville, she took the LSAT, the entrance exam to law school, in addition to competing in the AMC3. Deakins emphasized that participating in the moot court reaffirmed her desire to pursue law school. Three students represented Milligan in the House of Representatives and the Senate during TISL. For the weekend, the two chambers were comprised of college students who authored, presented and debated legislation. Tessa Stevenson, a senior from Elizabethton, Tennessee, and Brianna Snyder, a junior from Butler, Tennessee, served in the House of Representatives. Dalton Shell, a sophomore from Roan Mountain, Tennessee, represented Milligan in the Senate. Each student prepared bills to present to the legislature, and all of Milligan’s bills passed through both chambers. Their bills focused on second amendment rights, voter registration, drug prevention and healthcare. In January 2019, the executive council for TISL will select legislation created and passed by students, and those bills will be submitted to Tennessee’s state legislators for a vote. For each student, the experience increased their respect for the state’s legislators. Dr. Amy Edmonds, associate professor of political science, served as the faculty advisor for the group and accompanied them on the trip. Edmonds noted the importance of these competitions for helping students apply their knowledge to future career opportunities and current events. Posted by aegreer on December 5, 2018.